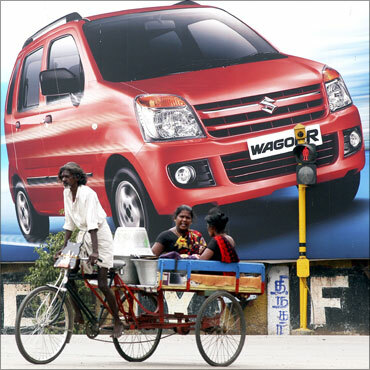 Rediff.com » Business » Chennai, the Detroit of Asia? Chennai is home to global and Indian auto majors like BMW, Ford, Hyundai, Mitsubishi, Nissan, Ashok Leyland, TVS Group, et cetera. It also has almost 35 per cent of India's share of auto ancillary units. So why has Chennai emerged as the Detroit of South Asia? There are many reasons, not the least of which is the Tamil Nadu government's investment-friendly industrial policy. With an impressive growth of 26.42 per cent last year, India is the second fastest growing auto market in the world, next only to China that grew at a scorching 42 per cent. 'The Indian auto component industry is moving rapidly towards grabbing the global auto component outsourcing market, which is expected to be worth $700 billion by 2015. With the spiralling demand from the domestic and international auto companies, the industry is emerging as one of the fastest growing manufacturing sectors in India and globally,' the survey notes. The Society of Indian Automobile Manufacturers' statistics show that auto exports from India rose by 49.59 per cent last year. The CII survey also says that India's exports of auto components would grow to $4.5 billion this year, compared with $1.8 billion in 2005. 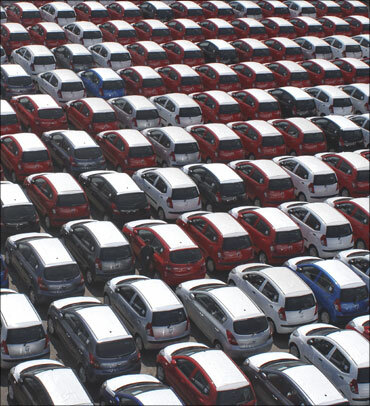 Image: Hyundai cars ready for shipment at a port in Chennai. Export of two-wheelers, which account for about 77 per cent of the total automobile production in India, grew at 49.11 per cent, while the export of passenger vehicles -- which account for over 15 per cent of the total auto sales in the country -- grew by 10.23 per cent in May as compared to the same month last year. It is also interesting to note that the country's second-largest bike maker Bajaj Auto showed a 51.23 per cent increase in exports while TVS Motors' exports rose by 50.89 per cent. 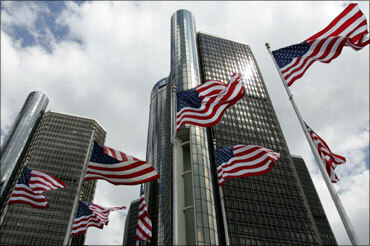 Image: American flags fly in front of General Motors Corp. world headquarters in Detroit, Michigan. There are 46 registered OEMs in India. Out of these 15 are located in the southern states of the country. This shows that one-third of the concentration of the auto industries in India is in the four southern states. In the southern states of India, there are about 74 projects which are at different stages from planning, implementation, or deferred. Of these, Tamil Nadu has the maximum number of projects (38), followed by 24 in Karnataka, 10 in Andhra Pradesh, and 2 in Kerala. Ford was the first global auto manufacturer to come to Chennai, and it was followed by many more. The latest to enter is Nissan. On being asked whether he was happy and satisfied with Chennai, the Ford India managing director, Michael Boneham, said, "Yes, we are satisfied. You have a very stable government and legislative environment. There is a transparent industrial policy no matter which political party is in power. You have governments very supportive of the industry. The second thing is the availability of labour. Educated reliable labour is the strength of Chennai. Overall, we are very happy with our experience in Tamil Nadu." But he was not that excited about the state of infrastructure. "I wouldn't say I am happy. There are still significant challenges in power, in terms of road, rail, etc. The governments are trying to improve the infrastructure but we would like to see real evidence of them improving it on an ongoing basis, in a very sustainable and quick basis." Kiminobu Tokuyama, chief executive and managing director, Nissan Motor India Pvt Ltd, also expressed similar kind of views though his experience in Chennai is short. "I don't think we chose Chennai because the other international players have been here for some time. Not just Chennai, but Bengaluru too has a good supplier base. In fact, the entire southern area has a good supplier and good technology base. The quality of labour also is quite good in this part. Also, there is a strong support from the state government. There is a good port and the Ennore Port is being improved." Nissan is quite satisfied so far with the progress of the project as they could finish the plant in a record 21 months from the start. The managing director admitted that it was a record for even Nissan to build such a huge manufacturing plant in such a short period. The company plans to export 110,000 cars in the first year, and it will go up to 180,000 the next year. And for the domestic market, they plan to hit 100,000 units per year. "We had all the expertise but we would not have been able to achieve this without the support of Tamil Nadu government and the labour force." When the Nissan team met the Tamil Nadu Deputy Chief Minister M K Stalin, they appreciated the support the government of Tamil Nadu had given so far and then requested the government to improve the road conditions. "The infrastructure has to improve. 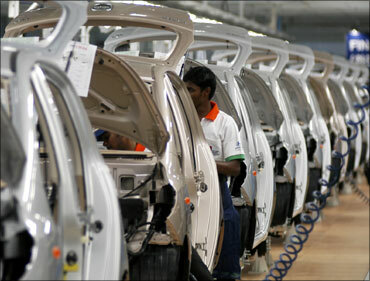 As you know, we will start shipping (new car) Micra, both, for the Indian market and for exports from our Oragadam plant. So we need good roads for speedy delivery. Infrastructure is one area that has to improve." Another auto company that is happy with Chennai is BMW that has set up base in the Mahindra City near Chennai. Abhay Dange, general manager press and corporate affairs, BMW, says, "The first reason why BMW chose Chennai was because of the infrastructure provided by Mahindra City and Chennai. Then, the logistics like the facilities at the Chennai port. The single window clearance offered by the Tamil Nadu government attracted us and supported us. The experience in Chennai has been quite good so far. Mahindra World City is an excellent place. There may be power problems in other places but not in Mahindra World City." Ford's Michael Boneham, however, does not agree with the observation that Chennai is the Detroit of Asia. "I think it is very nice that people describe Chennai in this manner. But there are a number of automotive hubs in India, like Pune, and in Haryana and Gujarat, etc. My view is that it is good to have balanced development of the automotive sector across the country, not just in one area." 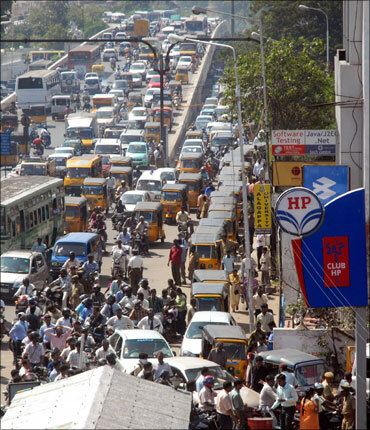 Yezdi Nagporewala observes, "Chennai has the potential to become one of the top three automobile hubs in the world. Today, Chennai accounts for 30 per cent of India's share of automobile industry and 35 percent of India's auto components segment. "However, despite being around 60 years old, the domestic auto industry lags behind other countries like South Korea, Brazil and Mexico in terms of production and sales. While it attracts lot of foreign direct investment due to its cost competitiveness, it is yet to match Chinese cost structure and the ease of conducting business." "Further, while Chennai has catapulted itself to be a manufacturing hub, its research and technological spend is much lower than its Asian peers. Accordingly, we believe that the industrial belt will have to invest significantly in research and development," says Nagporewala. "Also to maintain its global competitiveness, the government has to continuously work on developing infrastructure in the cluster. Infrastructure poses the most visible and obvious challenge for Chennai's development today. 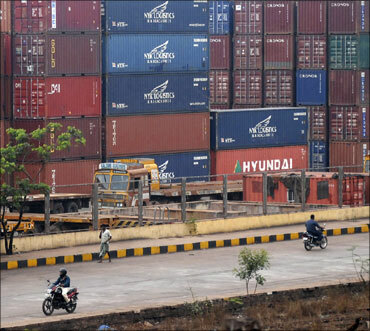 Considerable investment is required to improve the city's rail, road and port infrastructure," Nagporewala adds. Image: Chennai's infrastructure needs improvement. "As per the Eleventh Five-Year Plan report, in the next seven to eight years, the automotive sector in Chennai is expected to grow into a business of $15-20 billion with nearly 500,00 additional jobs. The sheer scale of operations will create availability of talent as a major constraint." So, the question is, does that qualify Chennai to be the Detroit of Asia? According to the CII survey, the Indian automotive industry is expected to grow at the rate of about 13 per cent per annum over the next decade to reach a size of around $165-175 billion by 2022. The size of the global auto component industry is also expected to grow at 12 per cent over the next decade to reach around $160 billion by 2016. Nagporewala predicts a growth of 12-14 per cent over the next 5 years for the Indian passenger vehicle market. Export sales will grow at a rate higher than domestic sales. According to Tokuyama, the Indian market will soon reach 3 million cars and in a few years' time, it will reach 5-6 million cars. "There is a huge potential for Indian growth. The total market will, anyway, be growing but if you compare segment by segment, the small car segment will grow faster than the other segments." Michael Boneham also agrees with the view that it will be the small car segment that will grow the most. "We expect the segment to grow by 20 per cent year over year. That is the growth that is sustainable. I expect double-digit growth for the next 4-5 years. Then, you have to wait and see. Whether the double-digit growth is 10-15% or 15-20% or beyond that, depends on a number of other factors. But I am quite confident that we will see substantial double-digit growth in that segment." "To be frank with you," adds Boneham, all other segments in the automobile industry in India are also growing. That is good news for manufacturers and customers because they are getting much more choice now." He also said that "India will be one of the three countries that will have the highest growth. We see significant growth potential here provided infrastructure keeps up with the opportunity for growth and demand. I don't see any reason why India can't be the fastest growing market globally. But it has a long way to go." Image: Car containers wait at a port to be shipped out.